This young lady had worn a brace as a teenager but was not instructed to wear a retainer long term. By the time she was in her early 20s, her lower front teeth were starting to crowd again. She chose to wear an Inman Aligner instead of having fixed braces or far more expensive and slower clear invisible style braces. In less than 6 weeks her teeth were fully aligned again. A retainer was then fitted. The patient was delighted that she her treatment cost nearly half of the price of the invisible brace and was completed in 6 weeks with an Inman Aligner instead of the 6 months it would have taken with clear tray braces. his patient hated her lower front teeth. Fixed braces and clear braces would take at least 9 -18 months at a much higher cost. Instead she opted for the Inman Aligner which was just one simple device that she could take in and out to eat easily. She only needed to wear it 20 hours a day. In only 9 weeks her teeth were straight. She needed to wear a clear retainer full time for a month afterwards after which a fixed retainer was bonded to the back of her teeth. She whitened her teeth and got the result she wanted with less cost and minimal hassle. This young lady wanted a great smile but wasn't willing to have her teeth ground to stumps for veneers and also didnt want fixed braces on her teeth. 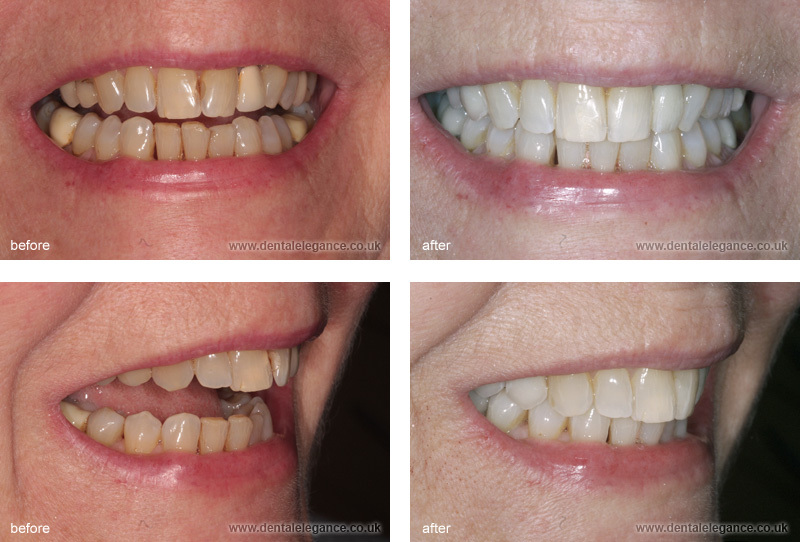 The Inman Aligner gave her the perfect solution and after her uppers were straightened all she needed was a little whitening and some simple bonding to replace her old fillings on the two front teeth. Her upper teeth were straightened in 12 weeks. She was so happy she went on to straighten her lowers. Tracy was worried about the wear and erosion of her crowded front teeth. Normally cases like this are often treated with porcelain veneers. These can give great results, but when the teeth are even slightly crooked, often large amounts of tooth have to be prepared to get the teeth into the right position. 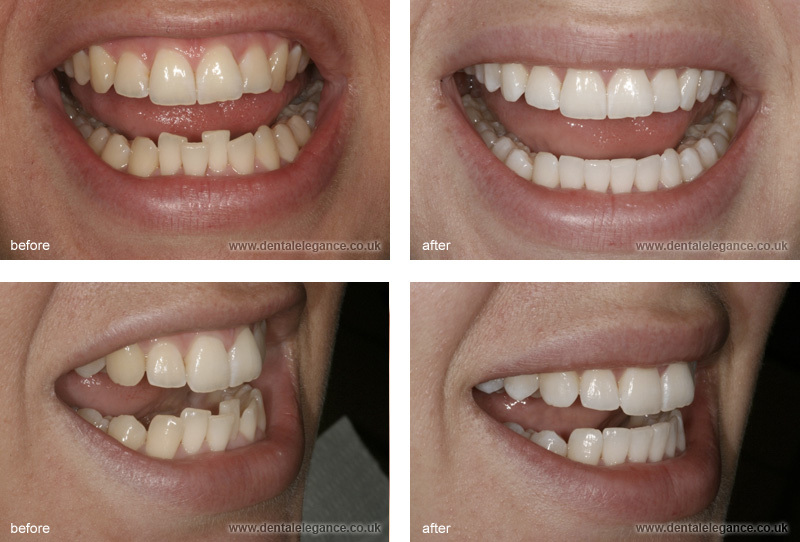 Instead she decided to align her teeth with an Inman Aligner first. The teeth straightened over 10 weeks. It was clear how much better they looked and instead of veneers, her teeth were whitened and the edges built up with direct bonding with no preparation at all. This young lady was concerned about the irregular appearance of her upper teeth. She was getting married soon and was unwilling to have any treatment taking longer than 6 months to straighten her teeth. 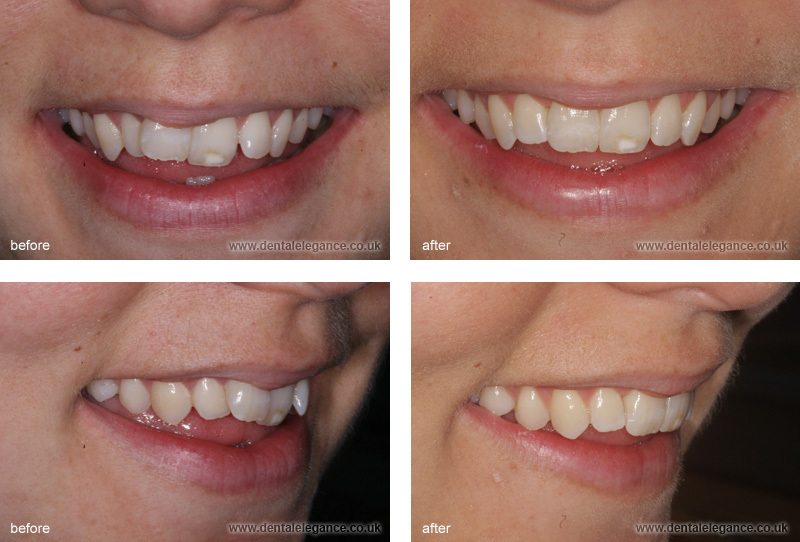 Her case took only 14 weeks to straighten with a single Inman Aligner. This lady had a lower Inman aligner to straighten her lowers over 8 weeks. 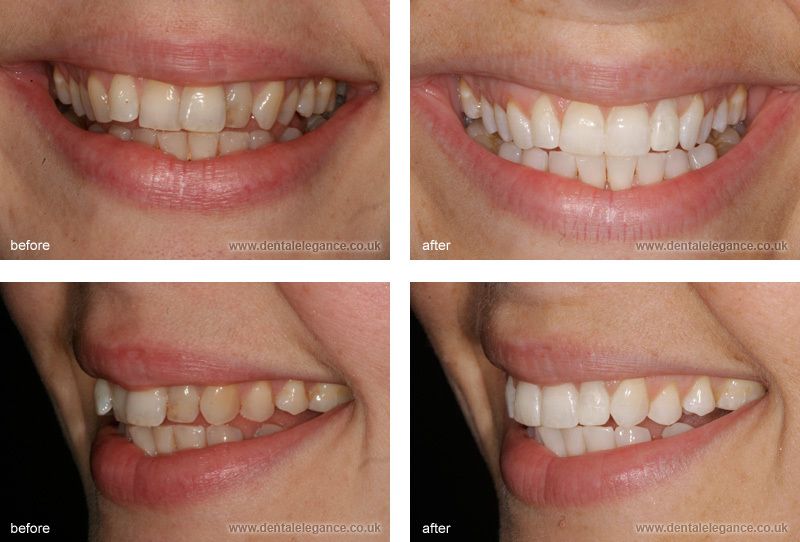 She then followed with an upper Inman Aligner to bring her uppers back over 10 weeks. 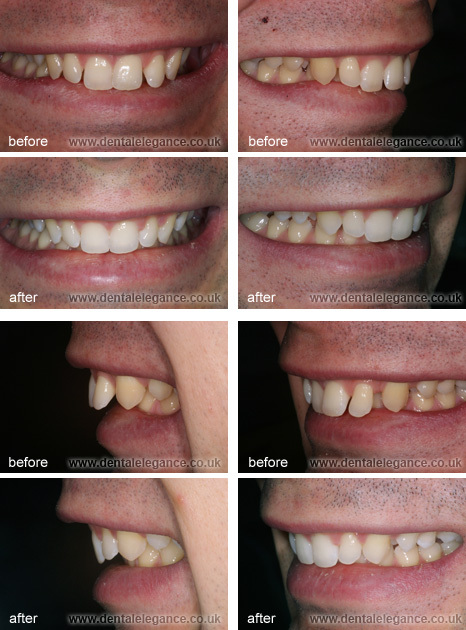 This Gentleman wanted his upper front teeth retracted, but did not want fixed braces because of his work and the time involved. He wanted something faster, but he also needed to be able to remove it when he needed. One single Inman Aligner retracted these teeth over a period of 16 weeks and a clear aligner was used to tweak the final result. This patient wore an Inman Aligner and expander for only 14 weeks before having her teeth veneered. Without aligning the teeth first the shape could never have been correct. 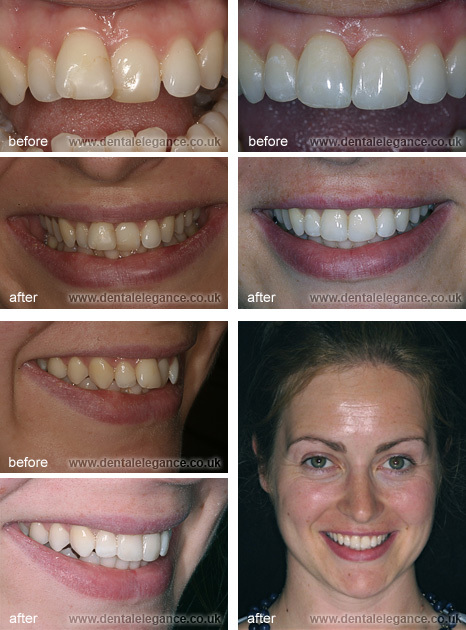 This lady wanted to improve her smile without resorting to veneers on all the teeth. She wanted to still keep the character, but to remove the blemishes that were spoiling her smile such as the mis-matching crown, the old fillings between the two front teeth and the crooked upper front tooth. An Inman Aligner was used to straighten this tooth over 3 months. The teeth were then whitened. The two fillings replaced with a cosmetic filling material and the crown was replaced with an all ceramic tooth that matched far better. This patient wanted his teeth to show when he smiled. Because they leaned back so much the front teeth were barely visible. 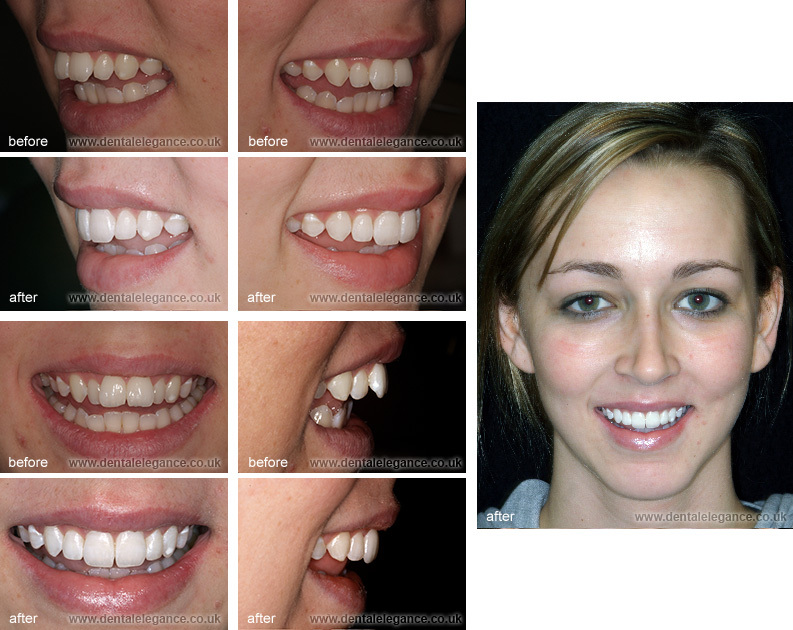 He only considered the Inman Aligner because he wanted something that was removable and would fit into his lifestyle. Fixed braces or any treatment taking longer than 3 months was totally out of the question. This young lady didnt like her two prominent front teeth. They made her smile look uneven. 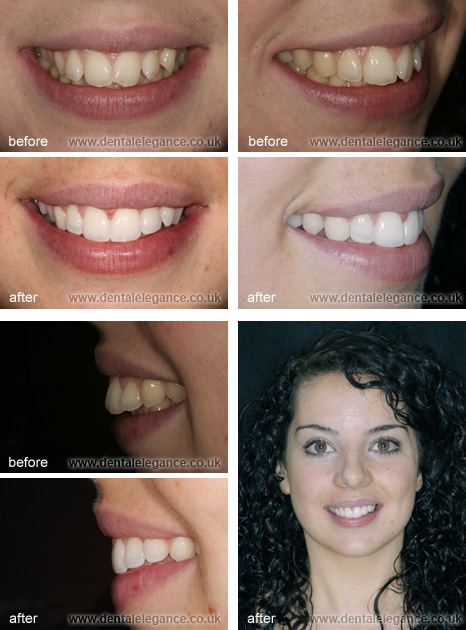 Using one Inman Aligner in less than 10 weeks, her front teeth were easily aligned with no extractions needed. She then had the chipped edges of her teeth repaired to improve the outline. There was no tooth removal needed at all. Composite bonding was used to achieve beauty with the ultimate in ethical cosmetic dentistry.